The purpose of terrorism is to provoke a reaction. The specific reaction is dependent on the aims of the terrorist or the terrorist group. Sometimes, it is to recruit supporters, or inspire supporters. Sometimes, it is to dissuade the target of the attack, or those similarly situated. And sometimes it is both. This is what distinguishes terrorism from common crime. Generally, although not always, the purpose of a common criminal act is the end of the criminal act. In larceny, for example, it is the taking and carrying away of the personal property of another with the intent to steal that property unlawfully. In other words, I want something you have and I take it. That is my reason for the crime. Regrettably, political theater often has the same purpose as terrorism — to elicit a response, good or bad. The bad was likely on display in Tijuana on Sunday, when hundreds of migrants attempted to storm border fences near San Ysidro. And the reaction was the one expected: sanctimonious vilification of a president whose policies are blamed for the fact that thousands of aliens are not able to enter the United States illegally. As a resident of Baltimore, perhaps I am a bit more used to the use of tear gas and smoke grenades for crowd control than most. The tear gas in San Ysidro, however, became a human rights cudgel for the president's opponent's pretty quickly. US agents have fired tear gas at Central American migrants, after some tried to breach the busiest border separating Mexico and the United States. Officers from US Customs and Border Protection (CBP) fired or threw the gas after a handful of migrants sought to open a small hole in concertina wire at a gap on the Mexican side of a levee. Images showed the migrants — men, women and children — running from the smoke. For a time, they also suspended all crossings at the world's busiest land border. A little girl from Honduras stares into the camera, her young features contorted in anguish. She's barefoot, dusty, and clad only in a diaper and T-shirt. And she's just had to run from clouds of choking tear gas fired across the border by U.S. agents. The move is drawing heavy criticism, as there are children among the migrants. No shots have been fired, but remember ... President Trump essentially gave the green light for retaliation a few weeks ago as the migrant caravan made its way north. The same tear-gas agent that the Trump administration is taking heat for deploying against a border mob this weekend is actually used fairly frequently — including more than once a month during the later years of President Barack Obama's administration, according to Homeland Security data. I wanted to provide an opportunity to discuss the events yesterday in San Diego, and provide an update of the incident involving elements of the caravan and their attempts to unlawfully enter the United States. Yesterday, U.S. Customs and Border Protection agents and officers in San Diego effectively managed an extremely dangerous situation involving over 1,000 individuals who sought to enter the U.S. unlawfully in large groups. They did so safely and without any reported serious injuries on either side of the border. Yesterday's incident involved large groups of migrants ignoring and overwhelming Mexican law enforcement, then attempting to enter the United States through vehicle lanes at San Ysidro and El Chaparral, and then through breaches in the international border fence between ports of entry. Elements of the group also engaged in dozens of assaults on agents and officers. Four agents were hit with rocks, but were wearing protective gear and did not suffer serious injuries. CBP was prepared for the multiple demonstrations, marches, and border pushes that we saw yesterday. As we've articulated for several weeks, we have been concerned about the size of the caravan, its primarily single-adult composition, and the aggressive and assaultive behavior at both the Honduras-Guatemala border and the Guatemala-Mexico border. U.S. government officials have noted the presence of criminals in the group, and the Government of Mexico has arrested over 1,000 caravan members for criminal violations in Mexico. All of those concerns were borne out and on full display yesterday in Tijuana. In the course of these events, individuals engaged in active assaults, throwing dozens of projectiles at CBP law enforcement personnel. Our Border Patrol agents were able to counter this activity, address the attempted group entry, and resolve the assaults with presence and less-lethal device deployments. Elements of the group then staged west of the port of entry and sought to press into the United States in the area of the Tijuana River channel. This group again became assaultive, with rocks and other projectiles thrown at our agents. In criminal law. A tumultuous disturbance of the peace by three persons or more, assembling together of their own authority, with an intent mutually to assist each other against any who shall oppose. Commissioner McAleenan is, respectfully, no Donald Trump stooge. As the CBP website makes clear, he is a career bureaucrat who has served presidents of both parties. In fact, under the Obama administration: "Mr. McAleenan received a 2015 Presidential Rank Award, the nation's highest civil service award." This lends credence to his statements. And what he is described is, in legal terms, a riot that occurred at the border on Sunday. The use of tear gas to control a riot is common practice. On November 24, 2018, Paris police used tear gas against rioters on the Champs-Elysées who were "oppos[ing] an increase in fuel duty on diesel" and other issues, according to the BBC. The Times of Israel reported that German police used tear gas in July 2017 during an anti-G-20 protest in Hamburg. And let's not forget the use of tear gas by police in Vancouver, British Columbia, in June 2011 after the hometown Canucks lost to the Boston Bruins in the Stanley Cup Finals, which was covered by the CBC. That riot is likely best remembered for a famous photo. 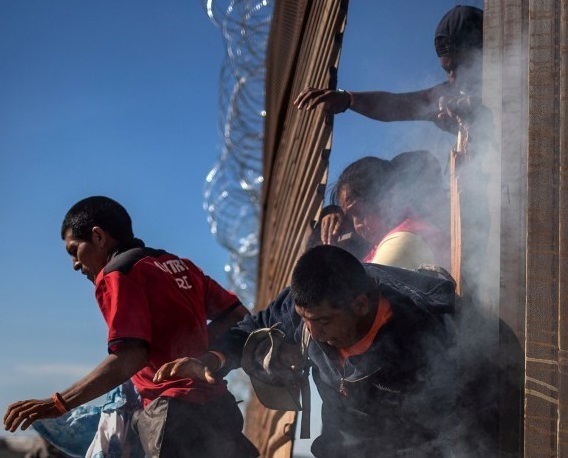 Speaking of photos, the most famous photo from the Tijuana incident was taken by Kim Kyung-Hoon of Reuters and shows "Honduran mother Maria Meza, 35, grabbing the thin arms of her two 5-year-old twin daughters Cheili and Saira as they frantically run from a tear gas canister spewing fumes," according to that outlet. The foregoing raises the question why exactly a mother would take her twin five-year-old daughters, one "in diapers" and the other "barefoot", to illegally cross a border fence "reinforced with razor-studded coils". Not to judge Meza, but frankly an encounter with noxious non-lethal tear gas may have been the least-bad outcome of that decision. To have done so in the midst of a riot, however, borders on child abuse, if it does not cross the line. Moreover, it is unlikely that she would be eligible for asylum even if she made it into the United States. As my former congressional colleague Nolan Rappaport has argued, a presidential proclamation issued on November 9 would still implicitly prevent aliens who have entered the United States illegally from receiving asylum, notwithstanding a temporary restraining order from Judge Jon Tigar of the U.S. District Court for the Northern District of California of an interim final rule that would have directly barred aliens who entered illegally from eligibility for such protection. Even assuming that proclamation does not have the effect that Rappaport argues it does, it is still extremely questionable whether Meza has an asylum claim. According to Kyung-Hoon, Mesa "said she hopes to be granted asylum in the United States due to rampant crime back home, and if successful will travel to Louisiana, where the girls' father lives." "Rampant crime" is likely not a ground for asylum in the United States. Even under Ninth Circuit law, "widespread civil unrest does not, on its own, establish asylum eligibility," although it does not preclude relief, either. Absent some nexus to another ground for asylum relief, however, Meza likely does not have a claim. This is especially true in light of the attorney general's recent order in Matter of A-B-, a decision that I have discussed at length. Returning to the issue at hand, however, San Diego Sector Chief Patrol Agent Rodney Scott stated on November 26 that "aggressive migrants trying to enter the U.S. from Mexico on Sunday used women and children as human shields as they hurled rocks and debris at officers guarding a fence," according to the Daily Mail. In response to this assault, according to Scott, outmanned agents "deployed tear gas to protect themselves and protect the border." It was likely Scott, or one of the agents in his chain of command, not the president of the United States, who made the decision to use tear gas in this instance. Nor is it clear what other choice they had. Assuming that Scott's statements are true (and there is no reason to believe that they are not), even greater harm could have come to those women and children as the migrants stormed the border and confronted the agents. As a group of hundreds of caravan migrants stormed border fences on Sunday, dozens made it through. Scott said they evaded Border Patrol. "What I saw on the border yesterday was not people walking up to Border Patrol agents and asking to claim asylum," he said. Agents arrested 42 border-jumpers, including some in a group who "passed 10 or 15 marked Border Patrol units" that were walking along the fence. "They were chanting, waving a Honduran flag, and throwing rocks at the agents," Scott said. "If they were truly asylum seekers, they would have just walked up with their hands up and surrendered. And that did not take place." At best, this was an attempt to enter the United States illegally and free from restraint. At worst, and most likely given the scenario described above, it was political theater, intended to elicit the response it received. Both from the Border Patrol, and from the press.